Smoldering embers beneath pots and skillets around the world spew acrid plumes of greenhouse gases and aerosols, polluting lungs and warming the planet. More than half of the world's population cooks food using these types of rudimentary stoves, which are often just a pot balanced on three stones above a fire. The stoves have global consequences for the climate, since sunlight-absorbing soot is the second-largest climate driver behind carbon dioxide. Biomass-fueled cookstoves form 20 percent of global soot emissions. However, the health fallout from cooking fires is immediate and devastating: A major study published late last year in the journal The Lancet found that air pollution from stoves kills 4 million people annually. Aid and development groups sprang up to tackle this issue as the problem crystallized, but one of the most popular solutions, improved cookstoves, may carry risks of its own, according to a recent study. The problem: Conventional cookstoves like this burn wood at relatively cool temperatures and create lots of soot. Photo courtesy of Environmental Science & Technology. Stoves that efficiently burn wood, brush and biomass pellets end up using less fuel than three-stone cooking methods, since they direct more usable energy from the fuel to the food. In the process, the stoves change what kinds of particles waft into huts and hovels. In a study published in the journal Environmental Science & Technology last week, researchers found that improved cookstoves produced three times as many ultrafine particles of black carbon, also known as soot, smaller than 30 nanometers in diameter for a given unit of fuel compared with open fires. Ultrafine generally refers to particles than have diameters below 100 nanometers. In addition, the team discovered overall soot emissions per unit of fuel were similar across different stove designs. 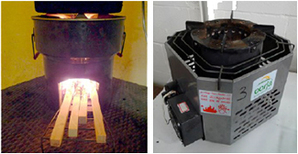 Scientists measured carbon particle emissions from three stoves in a laboratory, comparing a three-stone design to a rocket stove and a gasifier stove, two commonly used designs for enhanced cookstoves. In a rocket stove, the fuel burns in an insulated chimney below the cooking surface while a gasifier heats the fuel up to extract hydrogen, carbon monoxide and other gases to burn. In some ways, changes in particle emissions are inevitable side effects of more efficient stoves. "If you have hydrocarbons being burned with poor combustion, you get a lot of big particulate matter," explained Brian Just, the lead author of the study, who conducted this research as a graduate student at the University of British Columbia. "As you get longer combustion time and higher temperatures, you get these particles broken down more thoroughly." In dirty stoves, many of the ultrafine particles glom onto larger particles, so their overall number of tiny particles shrinks. With improved combustion, there is less aggregation, so ultrafine particles make up a larger part of the output. What do the smaller particles mean? Scientists are still trying to figure this out. "A (very) general conclusion from the last couple decades'-worth of research is that larger particles are more likely to produce effects that originate in the lungs, while the smaller particles are more likely to induce effects outside of the lungs," said Alison Elder, a professor of environmental medicine at the University of Rochester Medical Center, in an email. The solution? More efficient stoves burn less fuel at higher temperatures but emit tinier soot particles that penetrate more deeply into the lungs. Photo courtesy of Environmental Science & Technology. Elder noted that research has linked particulates to heart attacks, asthma attacks and chronic lung problems, but different sizes of particles can have different effects. Soot grains roughly a micrometer in diameter tend to be filtered by the nose and mouth, while tiny specks make it farther into the lungs and into the body. "In terms of the reactivity of large versus small particles, there are conflicting data in the literature depending on the experimental model used," Elder said. "The most important variable is the dose and this has not been well-characterized in many existing studies." Thomas Cahill, an emeritus professor of physics and atmospheric sciences at the University of California, Davis, said it's also important to consider what makes up the particles. "The U.S. standards for air quality are based upon mass, but mass never hurt anybody. It's what's in the mass that hurts you," he said. Simply burning a candle indoors can raise the number of ultrafine particles by several thousandfold, according to Cahill, but it doesn't mean you will get sick. For the more dangerous compounds like polycyclic aromatic hydrocarbons and soot, the solution is to direct them away from people. "The answer is ventilation," Cahill said. "You have to be very careful to make sure the energy in the house moves the air outside." But even exhausting the air to the outside doesn't mean people using cookstoves will be free from the fine black mist. The smoke and soot can linger outdoors, so whatever people avoid inside, they will inhale when they leave home. In many impoverished areas, homes are very leaky, so there isn't much of a difference in air quality on either side of a wall. Cahill recounted walking on a street in China where vendors heated chestnuts on coal, leaving the air so thick with soot he could taste it. The ultimate answer will have to be a cleaner-burning stove, one that more closely resembles a gas range than a campfire, according to Kirk Smith, a global environmental health professor in the public health school at the University of California, Berkeley. "We don't deal with pollution by just building a taller smokestack; you have to actually stop it," he said, adding that dirty stoves can afflict a household with as much smoke as 400 cigarettes in an hour, exposing everyone to dangerous emissions. "Babies don't smoke, but they are in the kitchen," Smith said. Getting better indoor air quality in the real world poses another challenge. "You can easily make the best woodstove dirty if you don't use it right," Smith said. Even when people recognize the problem, it often takes a massive shift in society to act accordingly. Smith noted that in 1285, King Edward I established an air pollution commission to cut through London's smog. The commission recommended banning burning coal in the city, a policy that didn't stick until 1956. With stoves that provide more heat for less energy, many users could also end up using their stoves more, thereby offsetting any efficiency gains. People may also use their stoves for thing other than cooking, like heating their homes. "In the real world, people use their stoves in all kinds of ways that are unintended," said Steven Rogak, another co-author and a professor of mechanical engineering at the University of British Columbia. Nonetheless, researchers agree that better stoves are a step in the right direction. "One of my main concerns is that people would look at this and say that improved cookstoves are worse [overall]," said Just. "People need to remember that because we're distributing improved stoves and distributing them to huge numbers of people, there needs to be education that goes along with that." The Global Alliance for Clean Cookstoves, an aid group that develops and distributes clean stoves, acknowledged that Just's paper raises important points. "The results of this study emphasize why it is so important to carefully consider both potential climate and health impacts when assessing stove performance," said Sumi Mehta, the director of programs for the alliance, in an email statement. Mehta co-authored a study just accepted for publication in Environmental Science & Technology this week that found that designers could cut black carbon emissions from stoves using forced drafting. "Of the presently available measures to reduce [black carbon] globally, substantially reducing pollution from residential solid fuel use would have the greatest overall health benefits from the global perspective," the study concludes.